I had a “light bulb” moment in China during discussion of the extreme poverty of her farmers at the University of Sichuan’s workshop on land policy in Chengdu last week. Intriguingly, Dr Sit Tsui from China’s Institute of Rural Reconstruction gave a run down also on Brazil, which inherits a colonial plantation economy where the urbanization rate is almost 85% and the poor have constantly fought for land reform. She said Brazilian urban poor and landless peasants are both “trapped in a dilemma”. Unlike large agribusiness holdings, the vast majority of farmers in China work their little allotments, virtually for a subsistence living. Then there’s the ‘people’s commune’ allotment within in each village, a bit like the old English commons to which Henry VIII put an end. Then the similarities hit me. Australian farmers are price-taking corks bobbing in the economic ocean, too. Australians owe their existence to these people–to the variety and freshness of their produce–but their earnings clearly do not reflect their importance in the economy. The large supermarkets Coles and Woolworths rip them off mercilessly, and they’ve just got to cop it. Australian farmers live poor then strike the jackpot in their old age when they sell the farm and have to move into town. Are small farmers, everywhere, destined to sell out to “efficient” monoculture agribusiness? How can this be so? Why is it that self-serving imbeciles can make obscene fortunes, whilst those farmers who grow the food that keeps us alive are forced to live in poverty? It’s The Law of Rent, pure and simple. 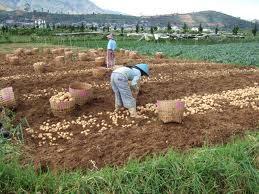 Farmers’ land rent is exceedingly low, or in the case of China’s sub-marginal subsistence farmers, it is nil. I suddenly realised if we were to capture the economic rent of land for revenue instead of arbitrary taxes, a social dividend could be distribute equally to all citizens, as advocated by great philosophers across the centuries. The humble farmer would be the first to benefit, because the greatest rents are to be found in the cities. Meanwhile, China introduces and wrestles with innumerable, inefficient land value capture policies in order to try to take the steam out of her real estate bubble before it explodes across the nation. But China now assesses her land values. Therefore, taxes like deed taxes, urban real estate taxes, the property tax, farmland occupation tax, urban land use tax, and land value increment tax could all be replaced at local government level by one all-in ad valorem rent on land values, struck at a suitably high rate. Whether or not they realise it, therein lies a real future for farmers: everywhere. business and this includes a fruit-stand or Farmer’s Market enterprise.